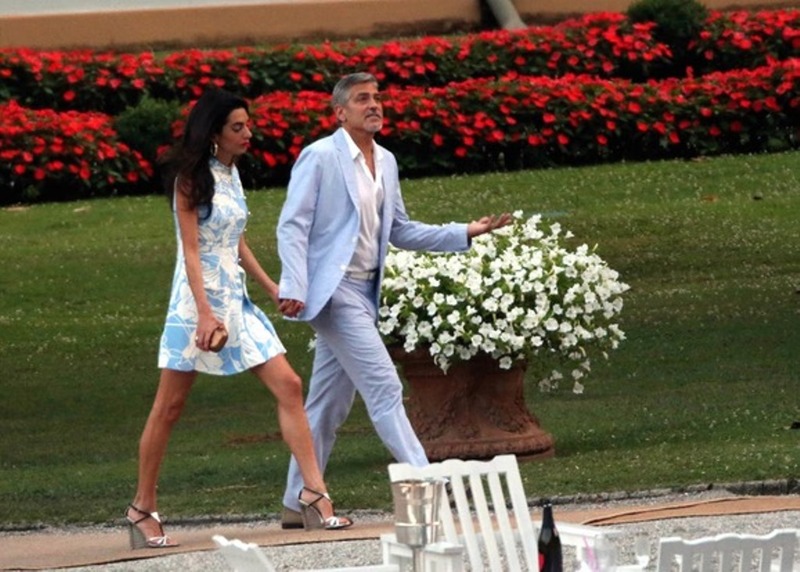 To celebrate their first year of marriage, George and Amal Clooney looked happier than ever as they colour-coordinated their outfits for a romantic dinner during their luxurious Italian getaway. with thanks to Eclecticstyleblog.com and Pat for the info. I like that 70’s fashion look on both of them…they look smashing!!! pleeaase amalll . stoppp doing that .i m becoming jealous . She has legs that go on forever…. I would like the dress better if the neckline was lower. This cut is very boxy and looks confining. Metalic shoe are not my thing…. I’m not a fan of this look. Amal’s dress looks too boxy. 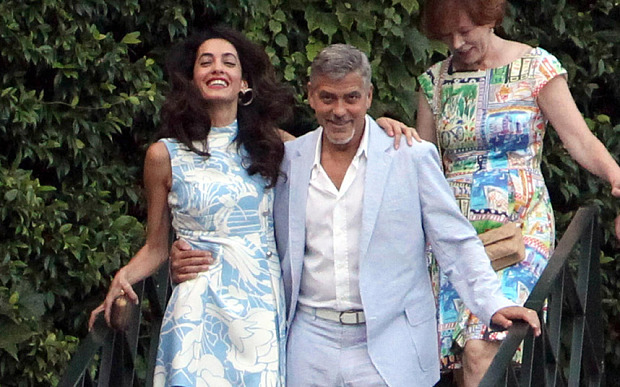 George’s suit – while appropriate for summer – ages him even more. I know everyone is always going on about how fabulous Kate Middleton’s hair is, but I think Amal’s hair is just spectacular. She must have a restraining order against frizz because I never see any and it’s so thick and luscious. I am totally jealous. Kate’s hair is actually quite frizzy and is super high maintenance. And Amal has a keratin treatment in her hair which prevents the frizz. For anyone who hasn’t tried it, I suggest you go for it unless your hair is super thin. It is the best invention of the 21st century!Amal looks quite stunning I must say. Is she looking a little fuller in the belly area or am I just imagining a possible baby bump that isn’t there? Not really lovin’ George’s outfit though. The white belt takes me back to Saturday night fever with John Travolta. George has given up on style since he got married . That’s correct, but then Princess Catherine – unlike Amal – does not need artificial hair AKA extensions for pumping up the volume :-). Amal’s hair looks fabulous but let’s not kid ourselves that it’s anything but super high maintenance. Remember how frizzy and dry it looked recently when she was on her way to the airport (presumably to Lake Como)? I’m sure that’s a lot closer to what her hair would look like without regular blowouts, extensions and, as Masreya says, keratin treatment. what i dont understand is why do people compare these ladies at all?? They are not even close t o anything about each other…. why compare them at all?? They were out to dinner with friends, they don’t celebrate their first year of marriage until September 27th. With their nightynight-trousers both of them look a little bit like coming out of bed…. 😉 . But very sweet and pretty. And I think, Amal is not too old to wear shortleged skirts and dresses – she has beautiful legs. She could wear this even if she would be 60 years. That`s not a question of age…. I thought that was a bottega woven knot clutch! They both look great. Fresh and cool. George is pretty predictable in his clothing attire. So it’s nice to see he changed up his look. Yes, Amal has legs that don’t seem to end. They are beautiful and so tanned. Ok I am officially jealous of her. There I said it. They look soooo happy. They both look gorgeous and happy and in love!! I agree with you about the shoes jacklyn, i love them too! especially Amal’s version, platinum instead of black on the top. I think they were a perfect choice for this oufit, many cant agree but it is so Amal! Perhaps that’s how she travels light: buy your clothes where you have a home. She usually buys a lot of her clothes online, and she loves Itailan brands. Good point, Minnow. It’s probably just a “pick up the phone and a call away”. Nati, how do you know she buys a lot of clothes online? Beautiful, full of life and happy! I love her ensemble. Thanks for the details, always fun to follow Amal’s fashion. Again a lovely outfit. 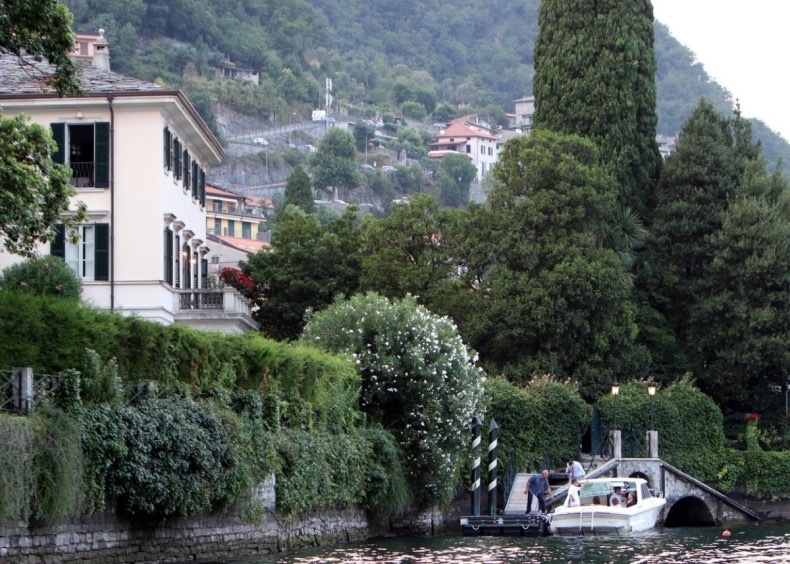 I like her Lake Como style very much. 🙂 But does she never wear flats?! Heels are not so practical when you have to go by boat but luckily she can pull it off. Can’t wait to see more! I think they both look great. Odd handbag choice for her though. She looks thinner and thinner by the day. Her clothes seem to hang on her. The skirts are so short. The proportion is all off, and it doesn’t suit someone of her age and stature. oh lala RM., arent you a negative person perharsp? you only see flaws?? In your eyes only darling, cheer up a bit! How about you know that she is having the time of her life? Does that upset you much? 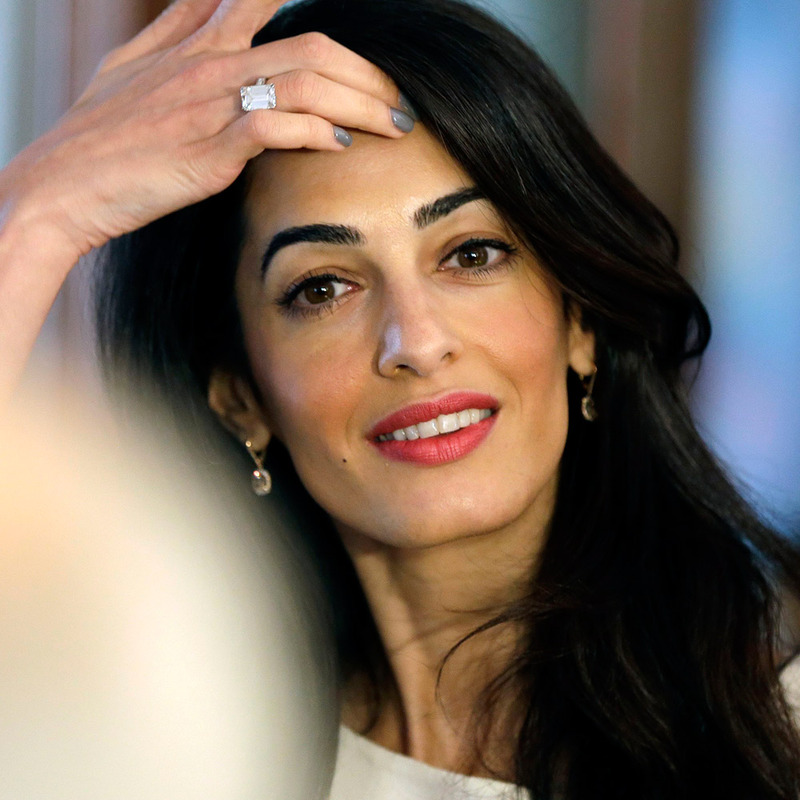 In some pics Amal eyes looks red ( can someone explain whay. ??! ) and i think the holiday is over alot of things happend tow hours ago and she is going back to work indeed ..
Red eyes are caused by the paparazzi flashes. Yes she is a tad thin but she looks happy and with legs like hers the length of her skirts/shorts are just fine. As far as her hair goes – stunning. She is unique in her fashion choices. I like that she doesn’t dress like every other ‘celebrity’. Some things work and some things don’t, but that’s what’s interesting about her. Bring it on Amal. Love your style. i am signing under you on that! Thanks Natalie as always! Well done – can I ask how you know that Amal buys her clothes online? Is there an article that I missed?!! It was not yet published, but i know it. How do you know? Nati? I love this dress, the color matchy matchy (cute and romantic)… those shoes ai ai ai…. je suis tombee par terre!!! The only thing i dont like is this style of dress in general, all the way to the neck. I have a short neck and feel often closto in these types of dress, but Amal seems to love it!! Another remark i make about Amal style is she is overdosing on the same type of non sleeve cut for her dresses/blouses and all. She has nice arms but i find these type of “non-sleeve ‘ cuts kind of unatractive, too uptight… reminds me of Michelle Obama , who also loves these same cuts. I think there are more feminine, atractive cuts to show the arms. It gets pretty boring after a while. But hey, i doubt Amal will pay attention to please me hah! /.